James Cridland, radio futurologist, is a conference speaker, writer and consultant. He runs the media information website media.info and helps organise the yearly Next Radio conference. He also publishes podnews.net, a daily briefing on podcasting and on-demand, and writes a weekly international radio trends newsletter, at james.crid.land. A busy week last week at the NAB Show in Las Vegas. The exhibitors’ floors were massive, noisy and busy, and it was good to see podcasting begin to be given a bit of a larger space. 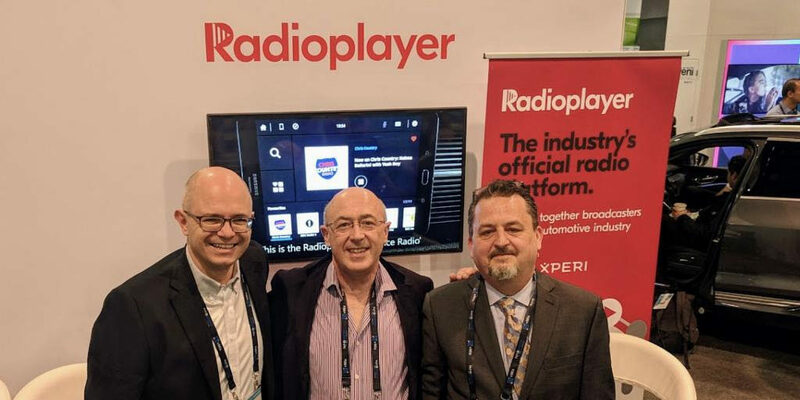 My personal highlight was seeing the great progress being made by Radioplayer: pictured above are representatives from Radioplayer Norway, Radioplayer Worldwide and Radioplayer Canada. Great to see the industry’s radio platform getting such good prominence. I spent my time being on a number of different panels and podcasts. Of note at NAB, a small but subtle change for many of the audio exhibitors, away from “here’s lots of stuff for your massive downtown studio complex” to “here’s lots of smaller stuff for your home studios”. Perhaps it was just me, but I saw a lot of miniature mixing desks and prosumer kit. An interesting switch. Good news, everyone! The Buggles Video killed the radio star has been covered. “Walk Off The Earth has collaborated with Sarah Silverman on a cover of the new wave hit, complete with flutes, drooling babies and a xylophone”, says Rolling Stone magazine. You may remember my concern that the repetition of “video killed the radio star” might lead people to believe that video has, indeed, killed the radio star, instead of the more truthful information that radio has survived fleeting competition by video. In the UK, here’s what Capital can do now – a new national breakfast show, which for the first time can be advertised on television. Here’s the ad, which entirely leaves me cold, but then, I’m about as far from the target market as possible. The fact that the station’s breakfast show can now get national coverage is good for radio. The UK’s talkSPORT have moved to new studios. I’m not sure the flickery background MARQUEE tag really works, and I’d be turning this into static text tomorrow if I had any say, but other than that, it’s an awesome studio and a real change for the network. While it barely posts any more, Absolute Radio 00s has the best and most random radio station social media account, bar none. A report here from a panel (one of many) at the NAB Show about the connected dash. Interesting to note how much time and effort iHeart is making here, and Waze’s integration with a variety of audio services. In Sudan, listeners during a time of crisis were treated to all the military hits, rather than any actual news. This looks interesting: the BBC is trialling dynamic personalised trails. I’ve often been excited and interested by personalisation being applied to something other than commercials; and it’s nice to see the BBC step up to the plate, even if it isn’t in BBC Sounds yet, just on a trial site. Radioplayer is hiring – this is a very good job if you are in the automotive business. Or if you know of someone. The best radio podcast has a new bespoke podcast feed: Radiomoments Conversations ▸ is well worth getting in your podcast player. The current episode is Richard Allinson. Here’s a thoughtful piece about radio’s future from Fred Jacobs. Radio is like a dinosaur you can’t put to sleep – yikes. This is a good thing, apparently: as quoted in a piece from New Zealand. Mind you, I found myself describing radio “as the cockroach of media”, meaning much the same – it’s almost impossible to kill, and that’s a good thing for all of us: though we do, sometimes, need to give it a little sunlight and some water.